All over the world, there are people who could live in one country or another. Some of these territorial disputes are relatively minor, while others could be the flashpoints that lead to all-out war. There are a lot of these, and they’re hard to keep track of. Enter Max Galka, a mapmaker whose work we’ve featured before. He created an incredibly handy interactive map that lets you keep track of just how many disputes each country is currently mired in, and which countries are having each dispute. 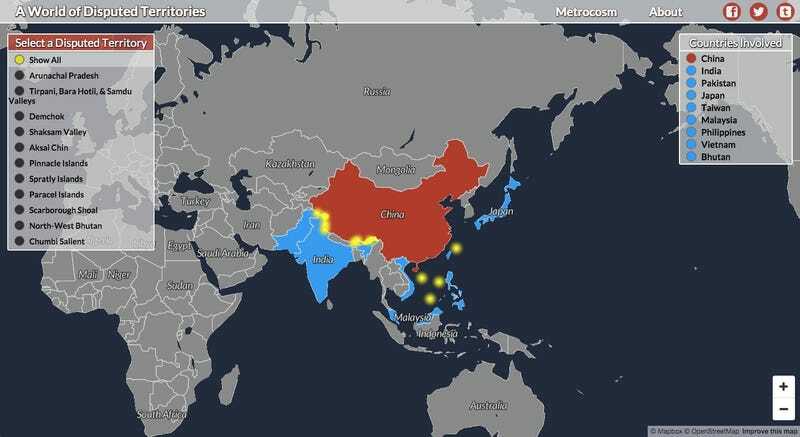 As you can see from the screenshot above, China is in a lot of disputes with India, Japan, Pakistan and Bhutan, among others.